Age should not be a discriminatory factor in access to health or care services. Some conditions are more likely to occur with age, as the body effectively “wears out” as part of ageing, such as osteoarthritis, heart disease and kidney failure. This places a demand on hospital services – for example orthopaedics, cardiology and renal services. There are considerable variations in admission rates to hospital with age that also expose socio- economic differences. While the impact of socio-economic deprivation on life expectancy and premature death is stark, what is also clear is the impact that it has on the likelihood of developing not just one but several long-term conditions (multi-morbidity), including mental health problems. This in turn leads to increased use of the health and social care system – but at a stage when independence is being rapidly lost, rather than at a stage where help can be provided earlier to prevent deterioration[http://www.parliament.uk/documents/post/postpn276.pdf]. A recent paper[Henry T, Polak T, Chant S. Commissioning for Prevention in Adults in Devon – An information paper. Exeter: Public Health Devon, December 2014.] 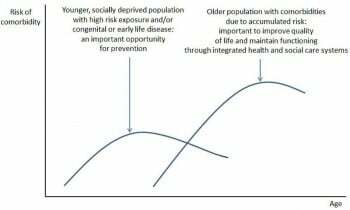 considered these factors in relation to age and socio-economic deprivation in Scotland. The traditional approach focusing on patients with only one disease dominates most medical education, clinical research, and hospital care, but increasingly needs to be complemented by continuity of care, care co-ordination, and above all a personal approach for people with multi-morbidity. This approach is most needed in socio-economically deprived areas, where multi-morbidity occurs earlier in life, is more common, and is more likely to include mental health problems as a complicating factor. The paper concluded that the most deprived areas experienced multi-morbidity 10 -15 years earlier than less deprived areas. This pattern can be seen in Devon (Figure 5.13) and demonstrates the need to address risk at an earlier stage for certain areas and groups (Figure 5.14). Managing patients with multiple diseases is a not straightforward matter – clinical guidelines based on single-disease research do not provide the overall guidance needed, and as each disease treatment pathway is added, the complexity increases. A recent paper illustrated this with a hypothetical case study: by applying five UK clinical guidelines to a 78 year old woman with a previous heart attack, type 2 diabetes, osteoarthritis, chronic obstructive pulmonary disease and depression. She would be prescribed a minimum of 11 drugs, with potentially up to 10 others recommended depending on symptoms and disease progression, and she would be advised to engage in at least 9 lifestyle changes. Then she would be expected to see her GP 8-10 times a year for her physical conditions and up to 30 appointments a year for lifestyle and mental health interventions, and this doesn’t take account of any extra visits to the GP or hospital when needed[Barnett K, Mercer ST, Norbury M et al. Epidemiology of multi-morbidity and implications for health care, research, and medical education: a cross-sectional study. The Lancet 2012; 380: 37-43]. Multi-disciplinary team approaches to management with continuity of care from a lead GP, removing drugs that do not seem to be adding any benefit, with the full engagement of the patient is the recommended approach, to ensure the best fit with the patient’s life and expectations. In describing this example, it is clear how the costs of long-term illness contribute to the strain on health and care systems. Research from the United States showed that overall health care spending for a person with one chronic condition is almost three times greater than spending for someone without any chronic conditions, and spending is about 17 times greater for someone with five or more chronic conditions[BMJ 2015;350:h176]. 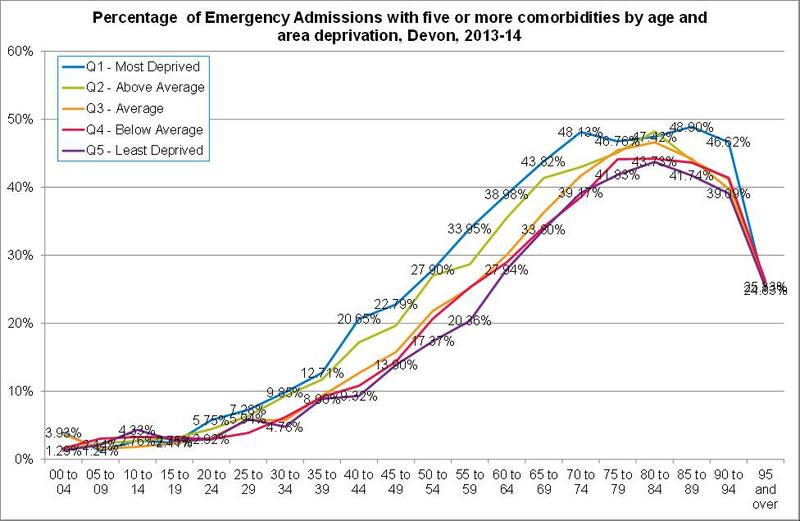 Figure 5.13: Percentage of emergency admissions with 5 or more co-morbidities by age and area deprivation, Devon, 2013-14. 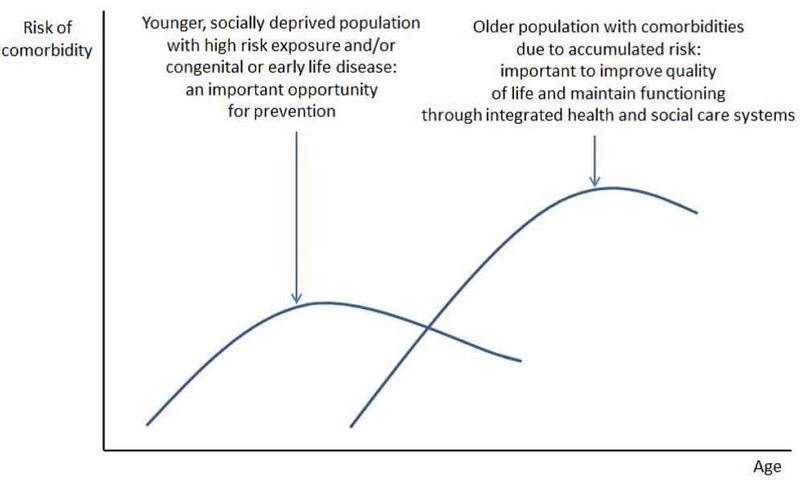 Figure 5.14: Illustrative diagram of two key populations at risk of comorbidities across the life course. Source: Living Well for Longer: National Support for Local Action to Reduce Premature Avoidable Mortality. London: Department of Health, April 2014. The rationale for this approach is that increasing the number of healthy years of life and remaining as independent as possible will reduce the burden on “downstream” health and care services, avoiding a slow decline in health and merely adding years of ill-health to life. This “fully engaged”, personalised approach was the basis of the financial modelling in the Wanless report[Anderson, G. Chronic Care: Making the Case for Ongoing Care. Johns Hopkins University and the Robert Wood Johnson Foundation, 2010]. 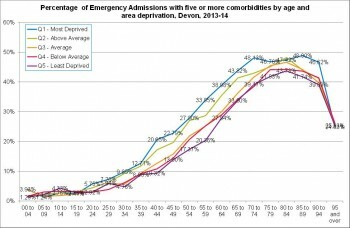 Given that we have a more elderly population in Devon than most other parts of the country, how do we support healthy ageing – and prevent or delay the onset of age-related disease and decline – promoting what is known as “active life expectancy”, where later years are free from disease and disability? Evidence from the most comprehensive and longest-running longitudinal examination of human ageing in the world, the American National Institute on Aging’s Baltimore Longitudinal Study of Aging (BLSA), has provided researchers with a vast amount of information about normal ageing. It showed that hearing loss is normal as people get older but varies from person to person, and that it is more likely in men than in women, and despite the “grumpy old man” or “grumpy old woman” stereotype, people’s personalities do not change much after age 30. People who are cheerful and assertive when they are 30 are likely to be much the same when they are 80. The finding suggests that marked changes in personality are not due to normal ageing, but instead are likely to be related to dementia or other diseases. Interestingly it was the Baltimore Longitudinal Study of Aging which demonstrated the link between Prostate Specific Antigen (PSA) levels and the development of prostate cancer, and that the amount of “free” PSA in the bloodstream could predict how aggressive the cancer was likely to be, up to ten years in advance. Other research has shown the increased risk of cardiovascular disease in people who develop an “apple” body shape (with fat around the waist rather than a “pear” shape with fat on the hips) and an increased body mass index (BMI)[Wanless D. Securing our Future Health: Taking a Long Term View. London: HM Treasury, 2002]. A research study about the health and independence of very elderly people in Newcastle provided compelling evidence about how most elderly people do not depend heavily on secondary health services[Healthy Aging: Lessons from the Baltimore Longitudinal Study of Aging]. The study looked at about a thousand people aged 85 years or older. It found that more than 90% of participants had seen their GP at least once in the past year but more than three-quarters rated their own health, compared with that of other people of the same age, as “good, very good or excellent”. This reinforces the importance of primary care as a point of contact for the assessment of developing frailty. Some of these habits remove potentially harmful products from our lives – such as tobacco or excess alcohol – or detecting disease early when it can be treated. But why is the Mediterranean diet so good for us? A genetic marker of ageing is telomere length in peripheral blood leucocytes. Some recent research[http://www.devonhealthandwellbeing.org.uk/aphr/2013-14/] indicated that people who adhere to a Mediterranean diet (irrespective of other factors) have been found to have longer telomeres – supporting the increasing evidence that the Mediterranean diet promotes health and longevity. A Mediterranean diet is the cornerstone of dietary advice in cardiovascular disease prevention, and the fact that it also links with a biomarker of slower ageing is reassuring[BMJ 2014; 349: g6674]. A recent study of co-habiting couples aged 50 and over showed that people are much more likely to make a positive lifestyle change if their partner does too. This applied to smoking behaviour, physical activity and weight loss[BMJ 2014; 349: g6843]. Small, incremental lifestyle changes in people’s daily lives can be effective, especially for physical activity[BMJ 2015; 350:h301]. One of the advantages of living in Devon is access to a range of natural assets. Research by the University of Exeter has shown that living near the coast is beneficial for health because people appear to take advantage of this to do more physical activity, and this makes them healthier[BMJ 2015; 350:h23]. Director of the London School of Hygiene and Tropical Medicine, AIDS researcher and co-discoverer of the Ebola virus in 1976.